**AN ABSOLUTE GEM OF A CHARACTER PROPERTY **** DECEPTIVELY SPACIOUS **** RURAL LOCATION WITH STUNNING VIEWS ****QUIET AND PEACEFUL LOCATION ****MUST BE VIEWED ! ** THE PROPERTY Is an absolutely stunning Edwardian property which has undergone major refurbishment and extension and now provides a very comfortable family home with excellent and spacious accommodation that also has flexible use and comprises an entrance porch with a door and window seat that then gives access into the Utility Room/Boot Room. An inner hall way then flows through to the superb Sitting Room which a very spacious, light and airy room with a feature fireplace and over looks the rear gardens and access via double opening double glazed French doors. There is a second lovely and cosy Sitting Room / Snug room which also overlooks the gardens and has a brick built fireplace with a woodburner. The Kitchen / Dining / Family Room is absolutely stunning and offers an extensive range of fitted units, cupboards and drawers with work surfaces and a central island, there is space for a range style cooker and an extractor hood above, walls are tiled in an attractive ceramic 'Hare' tile, plumbing and space for a dishwasher and space for under counter white goods, the kitchen then flows through to the Dining / Family area which has space for a large dining table and sofas, a feature fireplace and attractive tile karndean style flooring flows through. The Ground floor accommodation also offers a home office and a Cloakroom. The First Floor accommodation is fabulous with a galleried landing space of which all the further rooms lead off. The Master Suite is excellent and offers a dual aspect with far reaching rural views and rear garden views, fitted wardrobes and French doors that lead on to the Covered Balcony perfect location for your morning coffee. A door then leads into the En Suite Bathroom which has a modern and contemporary style white suite of a panelled bath with mirrored wall, double shower cubicle and a ceramic basin inset into a vanity unit, low level WC, chrome heated towel rail, tiled flooring and French double glazed doors and access to the sun deck . Three Further double bedrooms on the first floor all with views and a Modern Family Bathroom is fitted with a white suite. 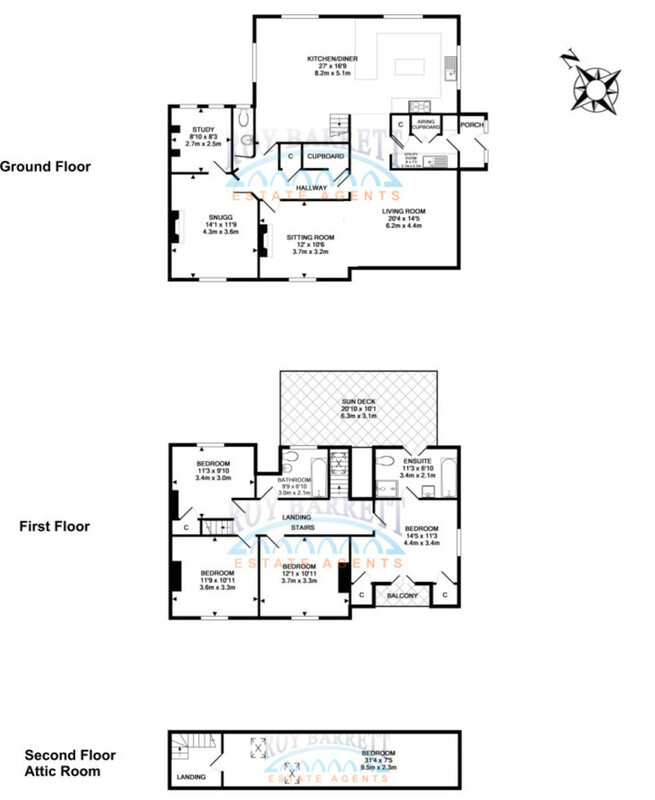 There is a staircase that then leads to the Attic Room/Bedroom 5 which has double glazed velux windows and would make an excellent playroom or hobbies room . and the Rear Garden extends to approximately a quarter of an acre and is mainly laid to lawn with attractive brick built raised beds , heart shaped flower bed and a gravelled patio/sun terrace. There is a very useful brick built Workshop with power and lighting and the whole area is hedged and enclosed. BAGBER Bagber is a hamlet in North Dorset being the birthplace of the poet William Barnes who was born in Bagber in 1801, located 3 miles west of STURMINSTER NEWTON is an interesting Old Market Town and is the most centrally sited of North Dorset's five principle towns, standing halfway between Blandford Forum and Sherborne in a most delightful setting on the banks of the River Stour and in the heart of the beautiful Blackmore Vale. There are a wide range of Shops, Banks, a Primary School and a Secondary School, Church, Medical Centre and Health Clinic, NHS Dentist, Private Dentist and a modern Leisure Centre. The Exchange is a multi -purpose building offering a community/arts centre. Coarse fishing in the River Stour. Blandford 9 miles, Sherborne 12, Yeovil 17, Dorchester 20, Bournemouth and the South Coast 27 miles. Gillingham 10 miles, has a mainline railway station. The A30 is 8 miles and the A303 approximately 15 miles. Services: Mains Water & Electricity. Underfloor heating.